In our days when again as it was in Lesya Ukrainka’s life time (1871-1913), tsar Alexander ruling it was illegal even to print anything in the Ukrainian language except historical documents, the Ukrainian people try to be a nation as a whole. At that time they united against the tsarist oppression of Ukrainian schools, theatres, all cultural, political and social life. Once more again the Ukrainian nation is in turmoil, the people of the East and West are divided by a conflict. Lesya Ukrainka’s poems and dramas are very applicable to our times.Her personal life in spite of her affliction (tuberculosis of the bones) was a prime example of a strong-willed fighter who created a great number of wonderful dramas and unforgettable poetry. 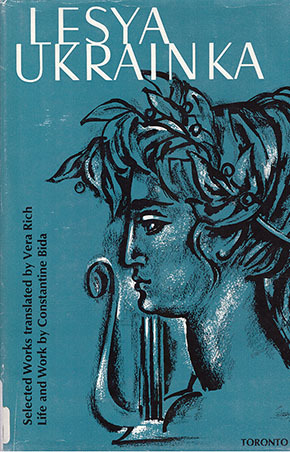 The cover of the book “Lesya Ukrainka” (life and work by Constantine Bida (University of Ottawa, Canada), Selected Works translated by Vera Rich (London, England), published in 1968 for the Women’s Council of the Ukrainian Canadian Committee by University of Toronto Press) is to the right. “What brought interest to Lesya Ukrainka to-day?”, I asked Janko, a Canadian of Slovak ancestry, who through his great grandmother (as his father told him) had direct connections and ties to Ukraine and always had interest in history of this region: Slovakia- Ukraine-Russia. The events which are happening now in Ukraine, started with Maidan and continuing to the present, resulted in an inquisitive spark from his part to understand the truth behind the scenes. Waken the dead from sleep’s eternal course. Life into chilly billows thou dost force! Where thou art, fantasy, is joy and springtime. We raise our bent brows once more heavenwards. Thou with a rainbow dost to earth unite it! Together Again! Celebrating the Birthday with the Friends and the Family, what can be more joyful than this?